Finally, cold weather is also here for the western half of Europe, especially Scotland, England, Ireland and Benelux. A rather strong outbreak of cold airmass is being advected into the region on the rear side of a deep trough / cyclone across northern Europe. 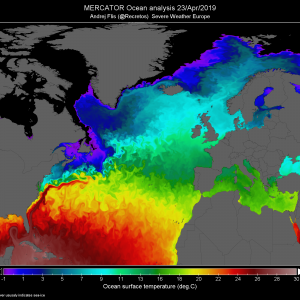 Meridionally transported flow pushes Arctic airmass through the western Europe towards south. Very cold airmass will start spreading from north to south tonight, reaching south Scotland around midnight. Very cold northerly winds will push cold weather south into Ireland and England until the late morning hours. Advection then continues into Benelux, France and Germany later tomorrow. 850 mb temperature should be quite cold over the western Europe, locally -8 to -9 °C at this level (approx. 1200-1300 m above sea level). Here are windchill temperatures in the morning and evening hours – should be a cold and breezy morning with local real temperature feel from -5 to -10 °C. Following this outbreak of cold airmass, also some snow is expected across parts of Ireland, Scotland and England – stay tuned for details soon!